Apple CEO Tim Cook at an employee meeting on Wednesday said the company recently sold its one billionth iPhone, a watershed moment for the popular smartphone. Cook told employees gathered at Apple's Cupertino, Calif., headquarters that the billionth unit was sold sometime last week. 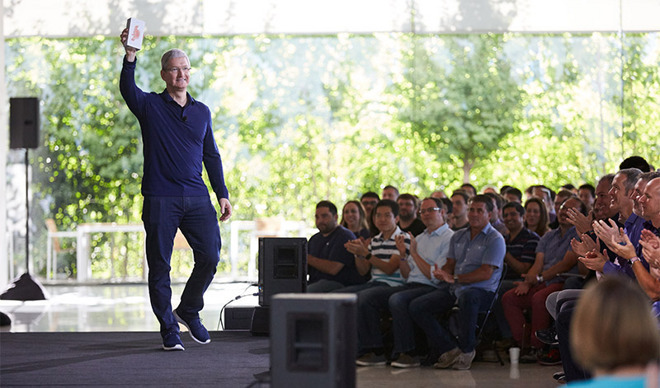 "Last week we passed another major milestone when we sold the billionth iPhone," Cook said. "We never set out to make the most, but we've always set out to make the best products that make a difference. Thank you to everyone at Apple for helping change the world every day." Late Apple cofounder Steve Jobs introduced the world to iPhone in 2007. At launch, the unassuming candybar smartphone was touted as a communication device, mobile web browser and iPod —then Apple's bread-band-butter product —wrapped up in a single package. Since then, iPhone has improved through nine iterations and four major redesigns to become one of best-selling handsets on the market. Not coincidentally, the device now accounts for a lion's share of Apple's profits. The news comes a day after Apple announced tepid sequential iPhone sales growth for the third fiscal quarter of 2016. While iPhone sales saw another year-over-year contraction, the company posted $42.4 billion in revenue and quarterly net income of $7.8 billion, beating Wall Street expectations. Looking ahead, Apple is widely expected to introduce a next-generation iPhone model at a special event this fall. Rumors and parts leaks suggest this year's update will come with minor tweaks to the existing iPhone 6 series design, the biggest modifications being a 3.5mm headphone jack deletion and a dual-camera setup for the 5.5-inch model. The most recent rumblings say "iPhone 7" —or "iPhone 6SE —will replace the traditional push-button home button with a capacitive Force Touch version, though evidence backing up those claims has yet to surface.